It’s hard to believe, as we have all only just returned to work/school, that the February half term is fast approaching! 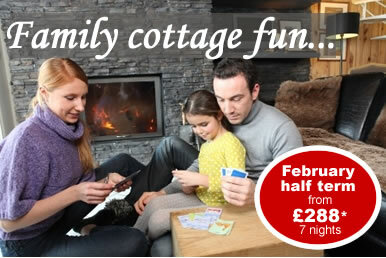 Don’t get caught with nothing planned, why not make the most of the February half term with a family getaway? Have great days out together, then enjoy a relaxing meal and card/board games in front of a cosy fire. With thousands of self catering cottages, lodges and apartments across the UK & Ireland to choose from you’re bound to find the perfect place within reach of the attractions and activities you want to see. What’s more, it doesn’t need to cost you a fortune…. there are 3 night February half term lodge breaks from £99*, 7 night cottage breaks from £288. * Prices quoted were available on selected properties at the time of publishing. Accommodation only – including online booking fee, based on UK stays departing 15/02/14. Subject to availability, operator booking conditions will apply.